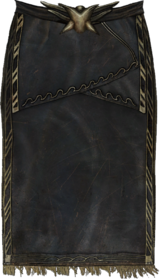 The Thalmor refers to an Altmeri governmental organization that has served each of the three Aldmeri Dominions in varying capacities. It is also a general term for the members and paramilitary enforcers of that organization. During the second Aldmeri Dominion, formed in 2E 830, the Altmer reconstituted the Thalmor as the new governing body of Valenwood. They claimed they had the authority to create this government on behalf of a claimant to Valenwood's throne, Camoran Anaxemes, whose ancestors had signed an ancient treaty with the Summerset Isles. As Valenwood previously possessed no true, unifying government, the Thalmor purported to maintain order in the region to uplift their Bosmer brethren. In reality, the formation of the Thalmor was far from an altruistic gesture: the Altmer desired to control Valenwood because the region, along with southern Hammerfell, harbored various pirate groups which had long threatened the Summerset Isles. Fed up with the constant pirate attacks, the Altmer hoped to secure the shores of Summerset for good by denying the pirates any safe haven from which to attack them. One Thalmor leader, Andel Crodo, wished to enforce a policy of non-intervention in non-Dominion lands, and that the decision was nearly unamimous. The Thalmor was dissolved a short time later when Tiber Septim brought Valenwood into his Empire using the overwhelming power of the Numidium. Sometime prior to the Oblivion Crisis in 3E 433, the Thalmor resurfaced as a radical political movement that espoused Elven supremacy and xenophobia. For years they were largely ignored, but in the aftermath of the Oblivion Crisis they exploited the confusion to claim credit for the salvation of the Altmeri people, which greatly enhanced their influence. In 4E 22, the Thalmor overthrew the Altmeri monarchy and seized control of the Summerset Isles, renaming them Alinor. Valenwood was brought under the Thalmor's control in 4E 29, creating the third Aldmeri Dominion, and the Elsweyr Confederacy voluntarily dissolved and reformed the ancient kingdoms of Anequina and Pelletine in 4E 115, which then became client states of the Thalmor. It is said that of all of his enemies, Emperor Titus Mede I never managed to defeat the Thalmor, and it would be Titus Mede II who would pay the price. When Titus II inherited the Imperial throne, the Thalmor instigated the Great War in 4E 171 by delivering a series of ultimatums to the Imperial City, then presenting the head of every Blades agent who had been stationed in the Aldmeri Dominion when Titus II refused their demands. After four years of bloody war that reached a stalemate, the Emperor was forced to sign the White-Gold Concordat, essentially giving in to the Thalmor's original demands. One of the terms was the outlawing of the worship of Talos, and the right of the Thalmor to enforce that ban within the Empire. Another term of the Concordat mandated that the Empire relinquish large tracts of land in southern Hammerfell to the Dominion, which outraged the Redguards and resulted in the secession of Hammerfell from the Empire. Fighting continued in Hammerfell, but the Redguards eventually forced the Dominion to the negotiation table and the Second Treaty of Stros M'kai, which stipulated that Aldmeri forces withdraw from Hammerfell, was signed in 4E 180. This led the Redguards to believe that the Concordat was a mistake, and Titus II had overestimated the Thalmor's strength when he signed it. By 4E 201, the Thalmor carried out campaigns of persecution against Talos worshipers from their embassy in Skyrim. It was widely believed that the Thalmor were preparing for a second attempt to conquer Tamriel, a conflict which the Empire stood very little chance of surviving in its present state of disarray. For game-specific information, see the ESO (First Dominion) and Skyrim (Third Dominion) articles.